information, visit our website and follow us on Twitter. held on the likelihood of reoccurrence, pending his court appearance. burglary. The investigation is continuing. gym was thoroughly searched, but nothing suspicious was located. unlocked. The investigation is continuing. And doesn’t take into account the many blankets she’s crocheted. takes three to four evenings. lives in nearby Rancho Cucamonga, visits. have something to do with my hands,” she said. For years, a friend of hers distributed her quilts to the homeless. buys yarn for the crocheted blankets from local thrift stores. after the couple had been married for 61 years. gives credit to this theory. She does say that she can’t imagine a life without quilt-making. families. For more information, please visit www.hillsides.org. of poverty. To achieve this ambitious goal, we are making it even easier to help those in need. homeless, and give those in need the opportunity be contributing members of society once again. when the spirit hits you, you can make a difference in the lives of those who are less fortunate. sufficiency. Some have come back to volunteer or been able to give back to their communities. change lives. 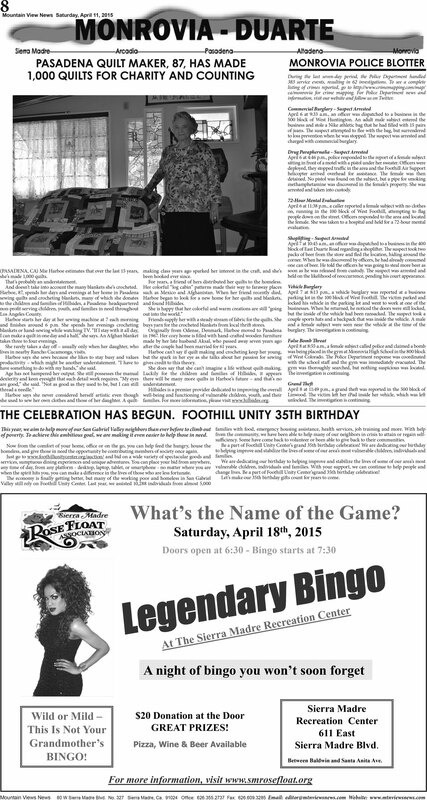 Be a part of Foothill Unity Center’sgrand 35th birthday celebration! Let’s make our 35th birthday gifts count for years to come. Saturday, April 18th, 2015Doors open at 6:30 -Bingo starts at 7:30Anightofbingoyouwon’tsoonforgetSierra Madre $20DonationattheDoorWildMildAnightofbingoyouwontsoonforgetRecreation Center611 EastSierra Madre Blvd. For more information, visit www.smrosefloat.orgBetween Baldwin and Santa Anita Ave.BINGO!